The newly relaunched Sino-Japanese Studies open access journal is coming along nicely with a selection of articles and translations, including many translated chapters of Liu Jianhui’s Demon Capital Shanghai: The “Modern” Experience of Japanese Intellectuals. The editor, Joshua Fogel, and I have decided to add a new Resources page to the SJS website where we will host various reference materials of use to students and scholars of the interaction between China and Japan. First up for inclusion on our resource page are two handy English language charts published in Fogel’s Articulating the Sinosphere: Sino-Japanese Relations in Space and Time which list Japan’s embassies to the Ming and Tang courts. While we had to secure permission from Harvard University Press to post these charts in their unedited published form, there is no reason why the content of these charts and the sources referred to in them can’t be used to improve, for example, the relevant wikipedia entry, etc. See also the Chinese entries and much more detailed Japanese wikipedia entries for the missions. If there are suggestions for other useful reference information or interactive materials to host at the Sino-Japanese Studies website, let us know and those interested in submitting articles to the open access journal may do so here. By now most of you have probably heard of the erasure of buraku — the segregated communities of Japanese outcastes — from Google Earth.1 The continuing discrimination against burakumin — hisabetsuminzoku2 is the phrase I was taught to use in the late ’80s, but it doesn’t seem to have stuck — which often uses their unique geographic footprint as a tool for identifying the otherwise indistinguishable burakumin from the rest of the Japanese population was the issue: having the maps on Google Earth made it too easy. Alan Baumler pointed me to peacay’s recent post of Dutch images of 17th century Japan. Some of them are quite accurate — the images of samurai, in particular, are quite nice — and based on the observations of Dutch traders and scholars at the Deshima trading station in Nagasaki harbor. Some of the images are based on Indian or Chinese models (though the tradition of religious statuary shared between these cultures means that they’re not as terrible as you might think). Some are pretty bizarre, but that’s par for the course before the 19th century. You can find the original here, in the full context of the book. Someone who reads 17th century Dutch might be able to help me, because I’m quite curious about the text at this point. Without it, though, I can only speculate. What’s wrong with this picture? Well, mainly the fact that the jinrikisha wasn’t invented for another two hundred years. 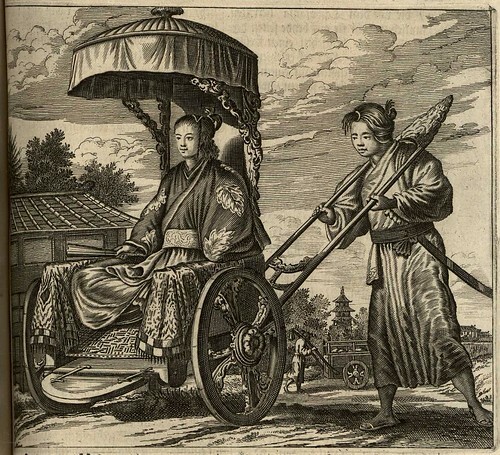 Also, Japanese did not use wheeled carts for transporting goods.1. Before that, Japanese traveled mostly by foot and by boat. Samurai travelled by horse, sometimes. Other elites — including samurai, nobles, village headmen, the wealthy — traveled by palanquin (aka litter). Even the transport of commercial goods was mostly by boat and by hand. While there seems to be some dispute about the origins of the rickshaw, nobody has ever suggested that it developed in the 1600s! I suspect what we see here is a failure of imagination. Having seen images of palanquins and bearers, but unable to concieve of transport without wheels, the illustrator added the — to him entirely obvious and necessary — elements. In the process, he created a shocking anachronism, and if anyone had taken these images seriously, could have radically altered the history of transportation. nominations for Cliopatria Awards for best blogging, 2008 (covering from December 2007 through November 2008) close Sunday at midnight. I am one of the judges so there are several categories I can’t nominate in (or be nominated in): you have to do it yourself! nominations for the December History Carnival (covering November) also close Sunday at midnight. Nominations page here. I will be hosting the carnival here, so keep an eye out! Harikikigaki, a book of medical knowledge written in 1568 by a now-unknown resident of Osaka, introduces 63 of these creepy-crawlies and describes how to fight them with acupuncture and herbal remedies. The Kyushu National Museum, which owns the original copy of Harikikgaki, claims the book played an important role in spreading traditional Chinese medicine in Japan. Add these to other resources like the Nagasaki University Library’s Metadata Database of Japanese Old Photographs, Database of Nationally Designated Cultural Properties and the Tohoku University Library’s Kano Collection – Image database.